Notting Hill isn’t just the location where the famous movie was shot. It has become the place where bloggers and influencers shoot their Instagram photos– and the residents hate it. They complain that the picturesque London neighborhood has become swarmed by “Insta-tourists” and begging them to stop taking photos at their doorsteps. Investigating selfies and self-portraits using a mix of theoretic, artistic and quantitative methods, Selfiecity compared photos taken in five major cities around the world – Bangkok, Berlin, Moscow, New York and Sao Paulo. The group recently added London to the mix, analyzing 152,462 Instagram photos, and the results are pretty cool. Last time we featured Vincent Laforet’s work he had just finished photographing his AIR project in London and Barcelona and was preparing to shoot above Paris, Berlin and Venice. Now that he has completed the project and released a book containing high-altitude aerial night-time photos from 10 iconic cities, Leo Laporte of The New Screen Savers interviewed Vince about his experiences up in the sky. Other than discussing some of the technical aspects of the shoots, Vince also discusses why these photos will never be captured again. Last month, TriggerTrap asked photographers in five cities around the world to come together to create ‘the most diverse time-lapse ever made.’ After a month of receiving, organizing and editing, TriggerTrap has shared the final results, LapseWorld. Beating 42,000 entries from 96 countries, amateur photographer Don Gutoski won the prestigious Wildlife Photographer of the Year 2015 grand prize, over $15,000 and crazy field cred for his image Tale of two foxes. Other winning photos include falcons, a whale, a liger with tigers and another fox. Wildlife Photographer of the Year is developed and produced by the Natural History Museum, London and was held for the 51st time. Start going through your archives as entries for the 2016 competition will soon be opening. 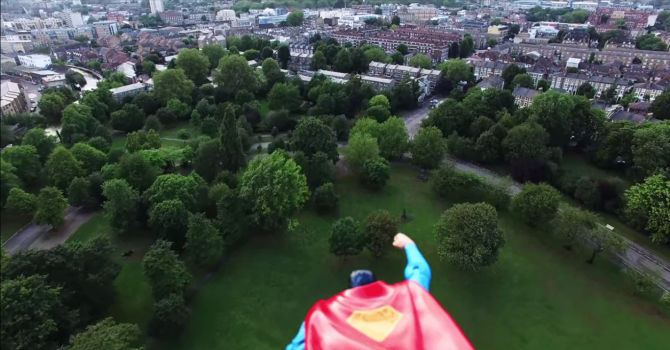 It’s A Bird…It’s A Plane…No, It’s Superman Riding A Drone Over London! This is one I’ll definitely be filing under the “Why didn’t I think of that? !” category…A U.K. based photographer and professional image retoucher by the name of Barry Craig, had the ingenious idea to attach a plastic Superman toy to his Phantom 3 drone and take it for a fly-about over London’s Victoria Park. Oh, gosh, it’s hard not to love. Check out the footage below–or on Barry Craig’s Instagram–while I make a quick run to Toys ‘R Us to pick me up some new action heroes. As part of his AIR project, which aims to show the world is connected by creating outstanding nighttime aerial photos; Vincent Laforet recently shot some incredible photos of London from a helicopter. The project began with a set of photos above New York city that went viral, and has since covered several more cities around the world. Other than London and Barcelona, which were both photographed earlier this month, Laforet will be spending the next few days capturing the scenic night views of Berlin, Paris and Venice. A behind-the-scenes video of the Los Angeles shoot, as well as a video detailing Laforet’s workflow, have been released and can be seen below.